ALABAMAWORKS! UPDATE NEWSLETTER - NOVEMBER 2016 - AlabamaWorks! Alabama business, education and workforce training leaders with the Departments of Commerce and Labor announced this week a major step in transforming the state’s workforce development efforts into one unified system. The new system, AlabamaWorks, will seamlessly link employers looking for skilled workers with Alabamians seeking jobs or job training. This week’s announcement marked a major milestone in the unification of Alabama’s workforce system, bringing together key components of the K-12 and two-year college systems, state workforce training and placement services, and industry. AlabamaWorks will more easily connect businesses with job seekers and help prepare workers by linking them to career and job training opportunities. Over the course of the next year, each of the state’s seven newly restructured Regional Workforce Councils will integrate its services into the new AlabamaWorks brand. As this week’s unveiling events in Montgomery and Birmingham demonstrated, we are well along in the process of transforming an Alabama workforce system that is already good into one that is more unified, more focused and more user friendly to businesses and job seekers alike. One of the key steps in creating a new brand identity was adopting a brand name and logo that effectively and clearly convey the essence of what Alabama’s workforce system is all about. 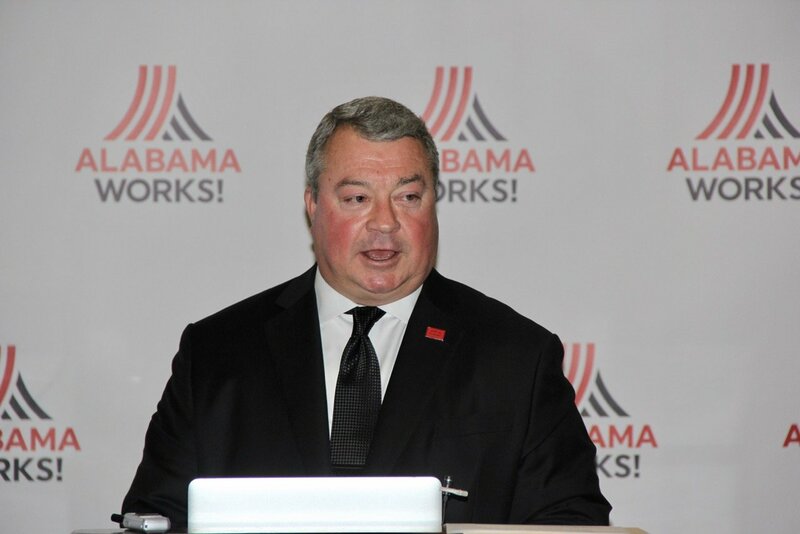 Our new brand, AlabamaWorks, was warmly welcomed by our partners and received great reviews in the media. I want to talk a little about how we arrived at our AlabamaWorks name and logo. A lot of hard work went into creating a new brand identity. Our team used a market-tested process that looked at numerous names and logo options. Not only did our team put a great deal of thought into the process, we also sought and tapped the opinions of the people who will use the system — employers and workers. In August, we had an online survey conducted to better understand how employers and residents perceive our workforce system. Some 440 Alabamians from across the state completed the survey. This sample included 90 Alabama employers who have responsibility for hiring and represented a mix of industries across the state. Also among those surveyed were 350 Alabama residents – including 63 job seekers, 129 who consider themselves underemployed, and 158 who are gainfully employed. The respondents answered questions to help us evaluate a narrowed-down list of seven potential brand names and five separate logos for our workforce system. AlabamaWorks! was the clear choice among both job seekers and employers. Respondents indicated that the name works because it is easy to say and remember, and also because it is clear about what it represents – the go-to place for employers looking for workers and residents looking for jobs. It’s a bonus that it is perceived to convey energy and excitement – things not often associated with job hunting. The new name and the new mark were then joined, and our new logo for AlabamaWorks was born. Other naming conventions and co-branding migration will evolve over time as each part of the workforce system begins to more closely align and interact with AlabamaWorks. In addition, a new brand asset portal launched Oct. 18. This password-protected asset portal has been designed as a convenient online repository of brand assets – from logos and style guide information to photographs and copy – that can be used by those who work in the system in support of the new brand. It includes the new logo and the new regional logos, along with a style guide that gives directions for how the logos can be used. The brand asset portal continues to be updated. As mentioned earlier, the new state portal website, AlabamaWorks.com, was part of the recent brand unveiling. This website is a vital tool for quickly connecting employers and job seekers in Alabama to the information and support they need. One other bit of important news on the rebranding process: Production has begun on the AlabamaWorks “brand enculturation” program. Videos featuring a number of statewide workforce leaders were shot and are being integrated into an interactive media program that will help everyone who works within the AlabamaWorks system know what the new brand is, what its charter means and how people can live and exemplify the brand in his or her day-to-day work. A: AlabamaWorks is the new unified workforce development system for Alabama. It is a comprehensive system unifying industry, education and state government agencies. Its mission is to recruit, train and empower a highly skilled workforce driven by the needs of businesses and industries. Q: HOW WERE THE ALABAMAWORKS BRAND NAME AND LOGO CHOSEN? A: The new brand name and logo were chosen through a months-long process that involved representatives of the various education and state agencies involved in workforce development and leaders from the business community. The brand name and logo were market-tested with the input of hundreds of Alabamians, including businesses and job seekers. Q: HOW DO I ACCESS ALABAMAWORKS? A: Businesses and industries seeking qualified workers and Alabamians looking for jobs and job training now have a central place to begin their search and to connect with each other,www.alabamaworks.com. There, employers and job seekers will be linked to programs and services available to them in their regions and, ultimately, with each other. More than 1,500 Decatur-area eighth-graders in October got a firsthand view of careers and jobs that could be available to them in the future at the Decatur-Morgan County Chamber of Commerce’s annual “Endless Opportunities Hands-On Career Expo” at the Ingalls Harbor Pavilion. Health care and information technology were the top two professions the students talked about, The Decatur Daily reported. According to the newspaper, Lee Lott, who is co-op liaison for Decatur High School, said school systems are required to administer the Kuder assessment to every eighth-grader, which in turn allows school districts to help students take classes based on their career path of interest. The online assessment allows students to pick two career interests and a wild card, she said. “When we know what they want to be, we can advise on what classes they should take,” Lott told the Decatur Daily. Read the Decatur Daily story.